A calf and a half (Viva! 's Cadbury farms investigation) | Viva! I suckled from my dog today: cat milk for your cuppa? But we’ve drunk milk for yonks! Read about the history of dairy farming. Cows’ milk is ideal for calves not humans. Here's why! Milk – it’s got the lot (of grot)! Milk hormone cocktail, anyone? Chinese people weigh less...but they eat more! What's their secret? Vegetables that stop cancer growth: The All Round Champions! What nutrients cause disease? Don't blame the plants! Acne and milk – spot on...but not in a good way! Cholesterol and heart disease – it's a heart breaker! Animal protein and bone loss: what's eating you? Separation: what happens to calves born to dairy cows? Goats' milk good for your health? Stop kidding yourself! EVERYONE’S GOING DAIRY FREE - and it's easy as pie! How much calcium is in these foods? Prepare to be amazed! Is soya milk a good source of calcium? Our undercover investigators went inside 15 dairy farms that supply Cadbury with milk and exposed the shocking reality of how milk for one of Britain’s top confectionary brands is produced. We filmed the shocking fate of male Cadbury calves. Useless to the dairy industry, these ‘by-products’ are separated from their mothers at only hours old and disposed of. 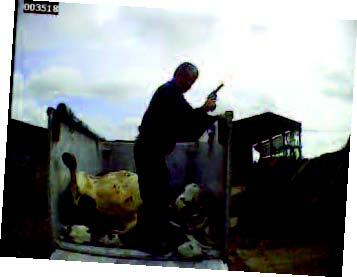 We witnessed a baby male calf being callously shot in the head. His body went to the local hunt for hound food. While this is the fate of numerous Cadbury calves, others are sold into the cruel veal industry or are slaughtered for pet food. We filmed the trauma of birth and separation, including excruciating birth complications where a jack is used to wrench the calf out of his mother. We also documented the stressful separation of mother and calf and the subsequent desperate calling of both, one to the other. The separated calves were housed in small pens in very basic conditions. We saw cows with distended udders producing 39 litres a day, zero grazed cows and those with debilitating illnesses – mastitis, lameness and milk fever. A beautiful little calf, just a few days old, bellows incessantly from a stone shed. He is as perfect as he could be – perfectly formed, perfectly healthy. He is distraught because he has just been separated from his mother and is bewildered and frightened. “He won’t be shouting much longer,” says a boiler-suited farmer as a land rover growls up the track into the farm, towing a high-sided trailer. “Come on then,” he says opening the gate and ushering the little creature towards the trailer. The teetering young calf doesn’t quite know which way to go and needs urging – but his legs give up on him and he falls over. The tailgate of the trailer is down, revealing a half-full mosaic of black and white, a pattern that quickly resolves itself into individual shapes – a large cow and several calves. All are dead. The driver picks up the calf and places him on top of the pile of corpses, climbing up after him, taking a revolver from his pocket as he does so. He holds the calf’s back while they both try to balance on the pliable bodies beneath their feet and then he levels the revolver at the animal’s head: “For God’s sake keep still,” he says with irritation. BANG! And the tiny creature collapses in a heap, his life extinguished just like the lives of 100,000 to 150,000 other male calves across Britain each year. The man climbs down, smiling at the farmer – he is from the local hunt. A notice on the side of the trailer completes the story: “Not for human consumption,” it says, “for feeding to hounds.” Royal hounds, as it happens, as this load of dead dairy animals was destined for the Beaufort hunt, patronised by Prince Charles, his wife Camilla and Prince William. Love your milk chocolate? Our investigation into Cadbury farms may leave a bitter taste in your mouth. Up to 150,000 new born dairy calves are killed in Britain each year – unwanted by-products of milk production.